I’ve mentioned before how it sometimes seems that everything you see is an invasive species, such as the cute little ladybugs in my yard that turned out to be an Asian species originally brought to America for pest control. But this little ladybug, fierce and ferocious (if you’re an aphid), is not the same species! Have I finally found one of our native ladybugs? Alas, no, it has two spots too few. The seven-spotted ladybug is closely related to its American cousin the nine-spotted ladybug, but the nine-spot is rarely seen these days. 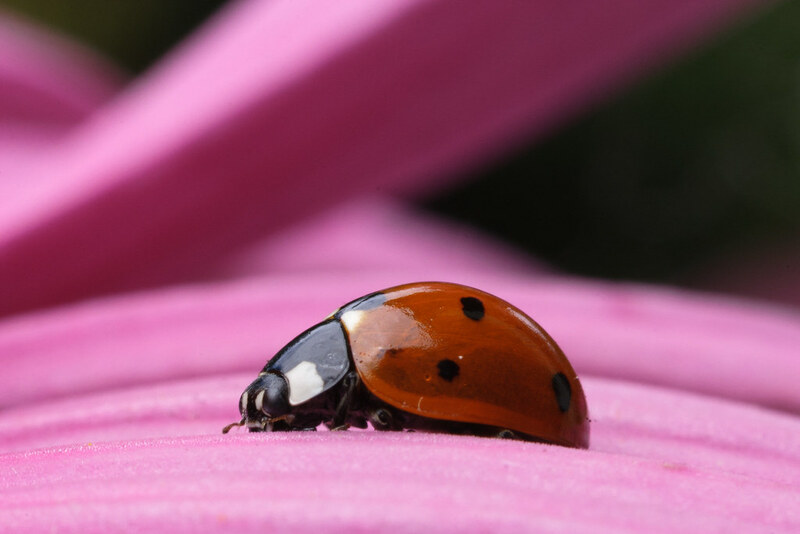 The seven-spot is native to Europe and, like the Asian beetles, was brought over to the States for pest control and then established itself in the wild. This one established itself on the petals of my purple coneflower. But the aphids are on the roses! The roses! For the love of Sammy, the aphids are on the roses! Ah well, I’ve gotten a little disoriented in foreign lands myself. This entry was posted in Insects & Spiders and tagged backyard, garden, insect, ladybug, Oregon, Portland, seven-spotted lady beetle, seven-spotted ladybug. Bookmark the permalink.